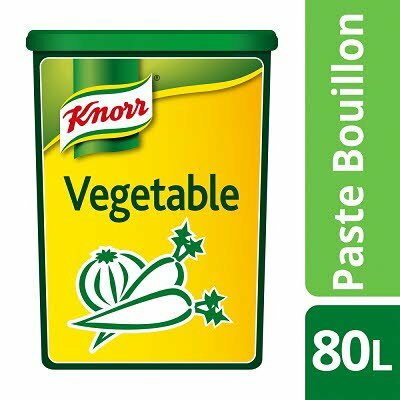 A vegetable flavour paste bouillon perfect for creating full flavoured bases. It can be used as a stock for soups and sauces or to add flavour into any dish. It is also available in beef and chicken variants. Salt, flavour enhancers (monosodium glutamate, disodium guanylate, disodium inosinate), palm fat, yeast extract, sunflower oil, potato starch, flavourings (contains CELERY), leek (0.8%), spices (fenugreek seed, onion powder, lovage root, garlic powder, turmeric, nutmeg), carrots (0.7%), colour (ammonia caramel), carrot juice concentrate, parsley, citric acid. 1) Pour 1 litre of boiling water onto a dessert spoon (22g) of Bouillon Paste. 3) Add more bouillon paste for a more intense flavour. IMPORTANT: Keep tub tightly closed in cool dry place.